Welcome to Santee Cooper Fishing! Santee Cooper Fishing is home to Doug's Guide Service, a charter catfishing guide service located on Santee Cooper's Lake Moultrie. Captain Ken Coffey and Doug Allen are experienced in finding, hooking, and landing the huge catfish the Santee Cooper lakes are known for. A charter fishing trip with Santee Cooper Fishing will provide your choice of daytime or nighttime fishing for Santee Cooper's world-renowned Arkansas Blue catfish, Flathead catfish, and Channel catfish. Our photo gallery is filled with examples of the excellent catches possible on our charter fishing trips. You will be fishing in style aboard our 30' Crest Triple-Toon equipped with a 225 HP Four-stroke Yamaha engine, Global Positioning System, depth finder, marine radio, sea anchors, heavy-duty catfish rods with heavy-duty level winding reels, and specially designed catfishing tackle. This boat can easily and comfortably carry a party of six and can accommodate the use of up to 12 fishing rods at once. Additionally, an enclosed Porta-Potty is onboard for your convenience and privacy. 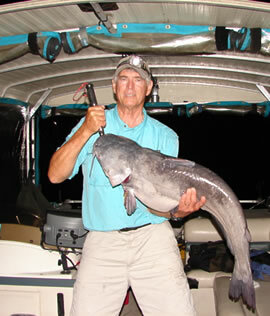 Santee Cooper Fishing and Doug's Guide Service gives you Southern-style catfishing at its best! And who knows? 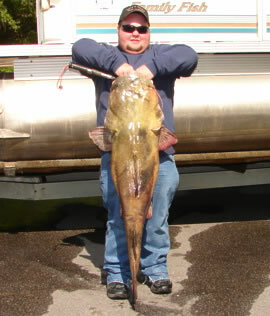 You may even hook a monster cat like this one! Lake Moultrie has the catfish, Santee Cooper Fishing takes you to them, and Captain Doug Allen provides the expertise to bring 'em into the boat. All you need to do is contact us and book your catfishing adventure! The catfish are waiting for you, and they're only getting bigger! You will catch catfish, and sometimes you will catch one or more monster catfish !